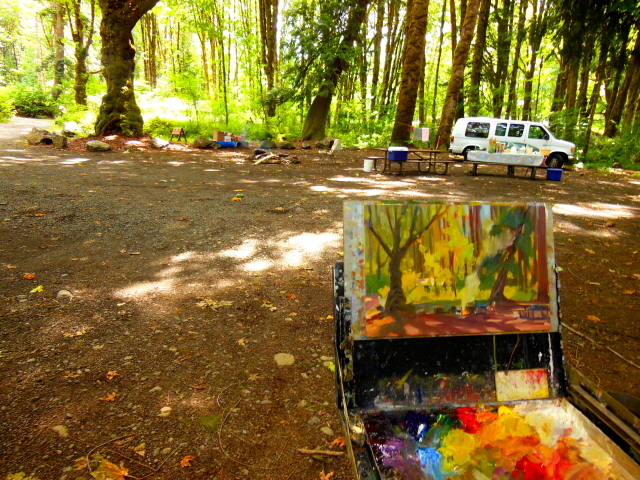 I facilitated my first paint out with the Plein Air Washington painters in June (I'm that far behind in posting!) We had a great time and the weather was perfect! 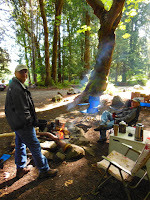 I reserved the group camp at the Dosewallips State Park and there was plenty of room for everyone but only a few of us actually camped. The camp spot was in a nice spot right next to the river and covered in shade by huge Big Leafed Maples. I highly recommend this spot for a group, especially if it is a hot summer weekend! 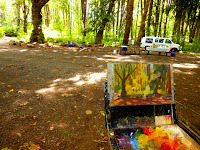 We had fun around the campfire at night and I got better aquainted with several new painter friends. 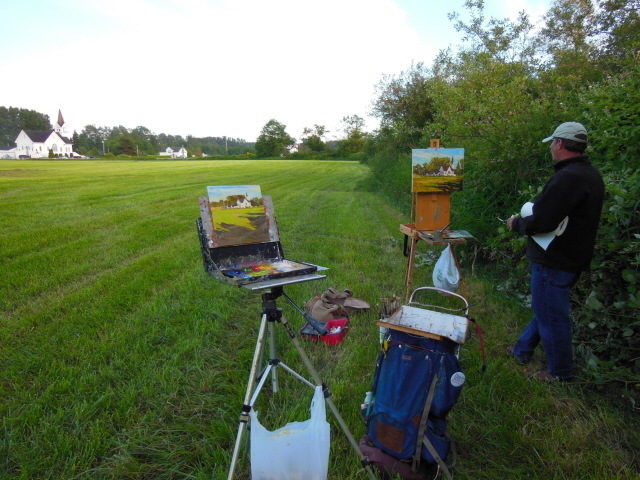 Every evening I went out to the same spot on the river and worked on a larger plein air painting. I used my french easel and prepared an 18x18 canvas. I video taped each progression of the painting. 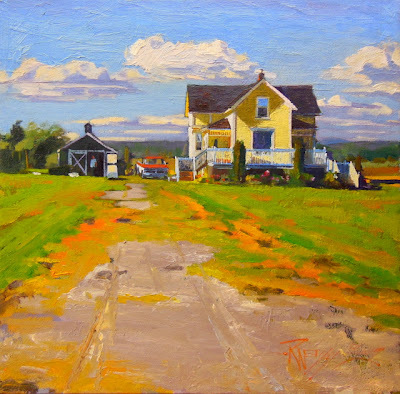 Interestingly this painting, even after I got back and worked on it in the studio, never worked out in my view and I ended up painting "Yellow House" (back a few posts) over it! I will post these videos for your viewing pleasure...=] In retrospect I wish there was more of my actual brush painting of the piece but at least you can see how it progressed and get a sense of location. 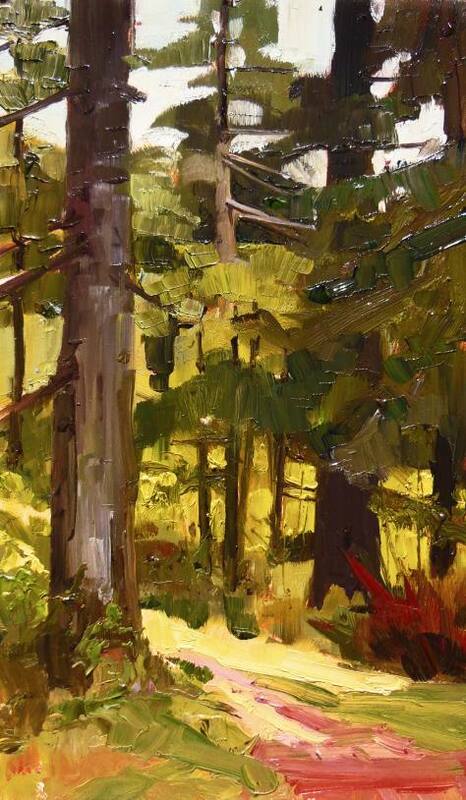 I'm a little out of sequence in time line but thought I would post this painting because the Gallery North , Beauty of the Northwest art show is approaching and thought some of you would like to go see the exhibition. I entered this show last year and had a lot of fun doing it. 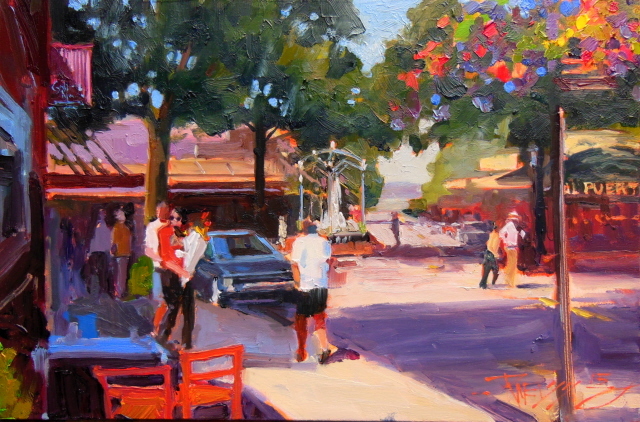 Edmonds is just a ferry hop across the sound from us and is a great place to go painting! I joined up with the other fun painters from Gallery North for this event and painted with them in two locations, the first one right in town for the farmers market day. 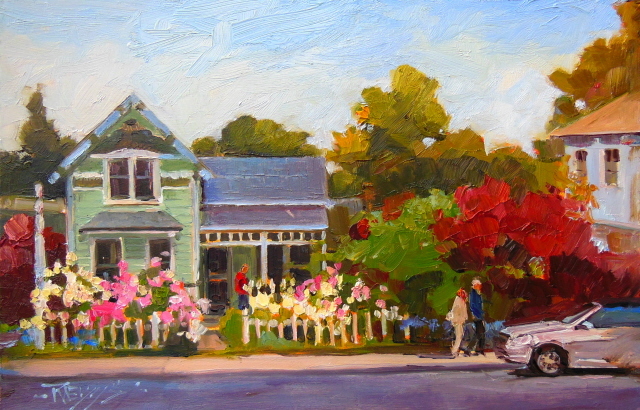 The artists reception is Sunday, August 11th from 1pm till 4pm. Hope to see you there! I have a couple more LaConner paintings to post before we move on.....This one was done in the studio from a photo I took on location. It was dark, cloudy and felt like rain when I left Poulsbo a week later for the workshop back in the LaConner area...The crew voted to soldier on no matter the conditions so I said a prayer and headed out. By the time I got there things were looking a little brighter and by noon the skies were clear! I really enjoyed sharing all my plein air tips with this group of happy painters and they took it all in and applied the lessons well! Me with the Posse, from left to right , Mark Bistranin,( with Jazz) Christine Troyer, Pat Young, Sharon Dennis and Sharon Curran. 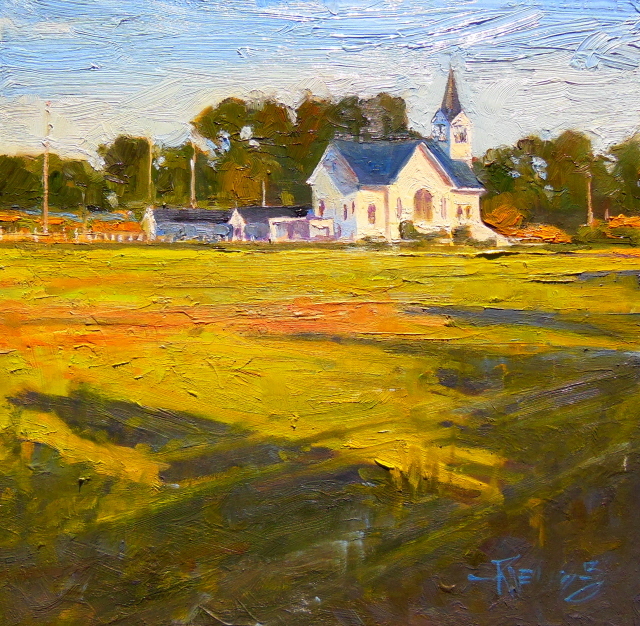 We set up to work at the location where I painted the church in Conway. There were a couple different views to work from without moving far. 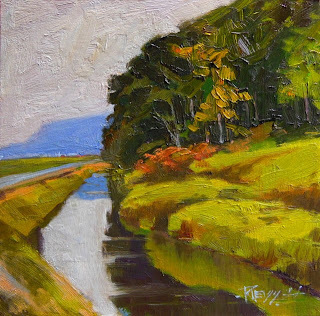 I did my demo painting of the Skagit river so everyone decided to apply what I showed them to their own rendition of the same view. The whole group did some amazing paintings and we all felt pretty good about the days work I went in to LaConner to visit the Seaside Gallery and get some dinner. FYI , The Brewery in town on main street makes the best pizza! The weather just kept getting better as the day went on. The light as I walked to my car was amazing! 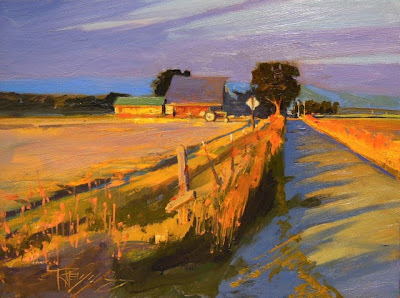 I decided to try for one more fast, evening painting and found a spot on a dead end road by a salt marsh that I never saw before. The mosquitoes and no-see-um nats were horrendous but the scene and the light was so spectacular I had to try and capture it. 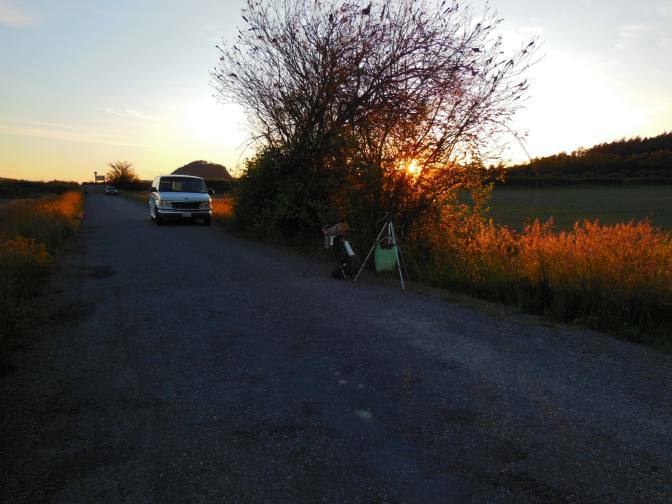 I spent about an hour getting the scene down as fast as I could with the light traveling very quickly. 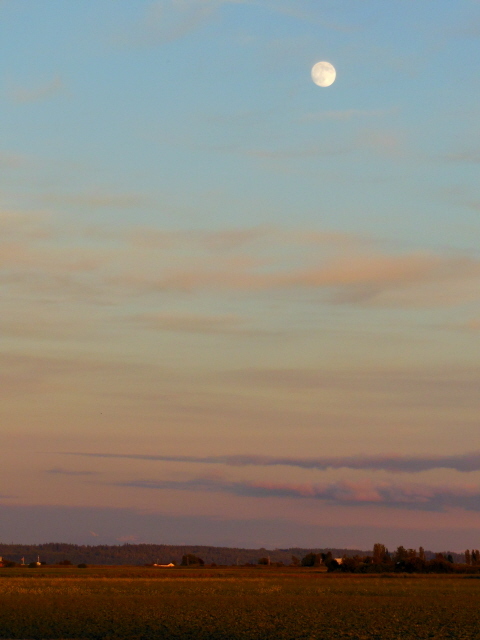 Just as I was packing up the "Super Moon" started rising over the fields! What a sight! No time for another painting and I was beat! I called Mark and he ran out in his pickup with all his gear, racing to paint the moon . After I finished the Irrigation Ditch there was still time and the light was getting better so I just turned the easel around and painted in the opposite direction. This was the last Skagit County painting I did on this trip...but....I headed back a week later to do a workshop requested by some of the PAWA painters who live in that area! So I still have some Skagit paintings and adventures to share. Email me at robinweiss@earthlink.net for more info. 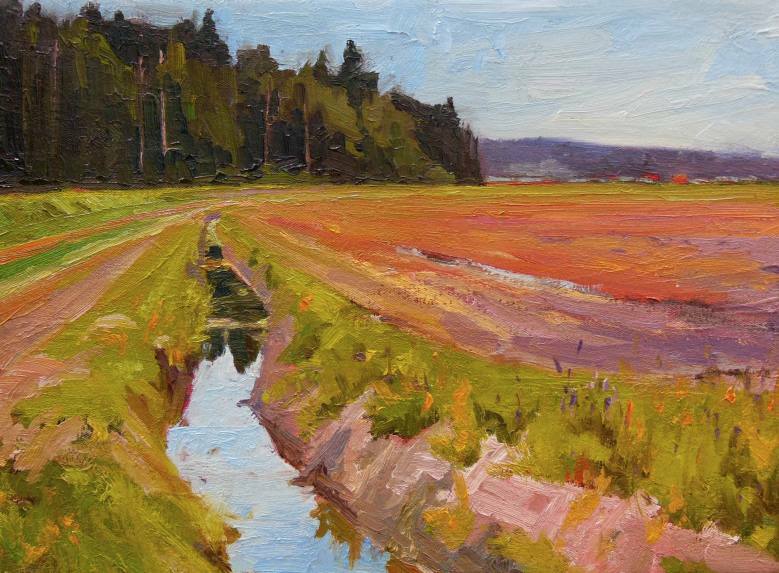 I'm still on my LaConner series and having trouble finding time to post consistently because I am off on other plein air painting adventures! But will try again to get current! This is a spot Mark showed me and we both set up to paint in different directions. I chose this irrigation ditch as a nice lead in to the scene. I also punched up the color in the field to make it a little more juicy....I had my french easel too and tried a larger canvas. In fact, I used an old painting and worked this scene over it. 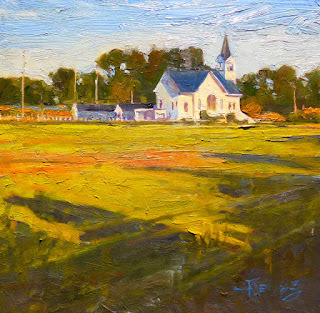 You can do that if you lightly sand the old surface so the new paint adheres.........One thing I hate to do is store old paintings that don't sell and I have moved on from..
"Evening Grace" Church in Conway, plein air, oil painting by Robin Weiss. After the group show at the Seaside Gallery, I got to spend some time with Mark Bistranin. Turns out we have a lot in common besides painting. One of the great bonuses of participating in PAWA events and traveling around painting in new places is the potential of meeting people and making new friends. Mark liked the Conway Church painting and we decided to go out and paint it again together .....Another great bonus of making new friends in new places....they often know the best locations and the folks that live in the area. Mark knew the folks who own the field behind the church and they gave us permission to paint the view from that direction!